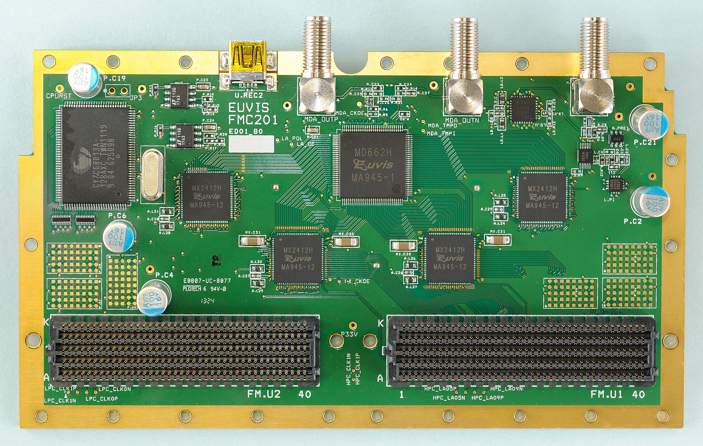 The Euvis FMC201 module is a high-speed single-channel FMC module ideal for use in leading-edge applications. The FMC201 generates CW waveforms with sampling rates up to 8 GSPS. The FMC201 module is equipped with the Euvis MD662H digital-to-analog converter (DAC). 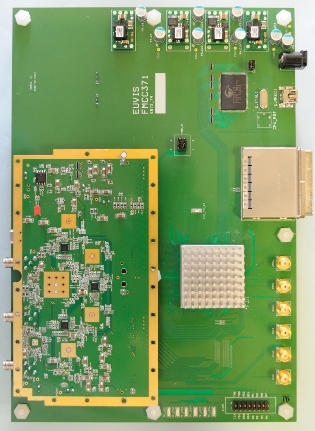 At 8 GSPS, the module provides analog outputs with bandwidth from DC to 4 GHz (Nyquist bandwidth). In addition to the 4:1 internal multiplexer of the MD662H, the module includes four 2:1 high-speed Euvis MX2412H multiplexers to further lower the input data rate and can directly accept advanced FPGA LVDS outputs. The total multiplex ratio is 8:1 and the required digital data rate is 1 Gb/s when the DAC is operated at 8 GSPS. The 96 LVDS pairs of digital data are fed through two FMC connectors, a high-pin-count (HPC) and a low-pin-count (LPC) connector. Sampling window select (SEL’s) and reset signals of the DAC can be independently controlled via the FMC connectors. The module includes three clock buffers to relax the need of high-power clock source. 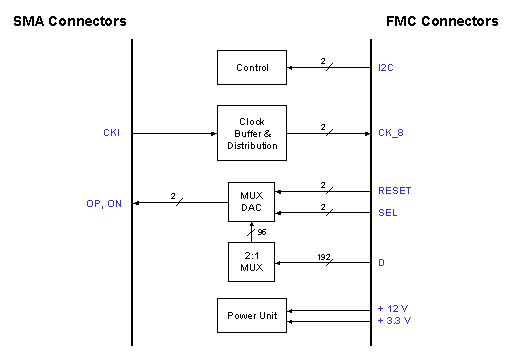 The amplitudes and duty cycles of the clock buffers can be programmed though the I2C interface. For formal quotations, availabilities, and quantity-specific orders, please e-mail info@euvis.com, or call 1-805-583-9888. In applications, FMC201 requires a VITA 57.1-compliant carrier board to provide all digital data, DAC controls, I2C signals, and DC power via FMC connectors. The carrier is required to provide both +12V and +3.3V power, with minimum current capacities of 2A and 500mA respectively. Digital data and DAC resets are in LVDS pairs. The DAC sampling selects and return-to-zero mode select are single-ended LVCMOS25. The carrier board can be an advanced FPGA evaluation board, such as Xilinx VC707, with proper configurations. The FMC201 module is tested using Euvis carrier FMCC371. The carrier consists of a Xilinx XC6VLX130T, a USB controller, and power modules. In the test setup, the carrier is controlled by a PC host via the USB interface. The carrier can store up to 32K words of data in memory. The maximum data length is 4 μs at 8 GSPS for each channel. 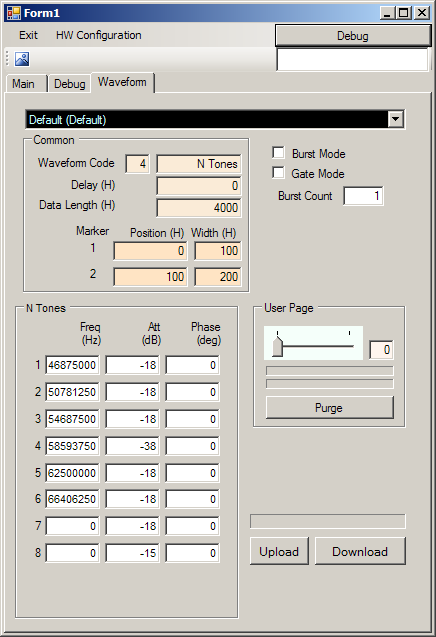 Several built-in waveforms are available within the FMC GUI. Waveform generation and download are performed in the GUI.